I love it when the seasons change and I remember all of the movies I save for those months. Winter? Basically any Christmas movie. Duh. But also, Little Women and While You Were Sleeping. Oh, Fall is for the best of the best. Dan in Real Life is like a big cozy cable-knit throw to wrap myself up in. The house is just the most perfect family getaway (I always thought it was in Maine, but it's in Rhode Island). They eat meals together, they do a family talent show, they exercise in the front yard, they do crossword puzzle competitions as a battle of the sexes. They make up songs about Ruthie Pigface Draper. I'll be the first to admit - it bothers me how bratty the daughters are to their father, but it doesn't stop me from loving the family togetherness. And the wedding at the end. And the Sondre Lerche soundtrack. All of it. Dan: Actually, I'm not smooth. I'm, uh, Dan. We all know that the feel-good football movies are not new territory. 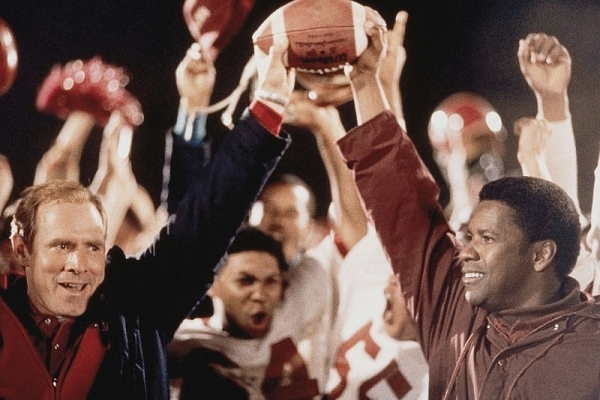 But we also know that Denzel Washington makes us believe in feel-good football movies again. There's a baby Ryan Gosling. A baby Donald Faison (who has been a baby since Clueless), baby Hayden Panettiere, baby Kate Bosworth! I can't ever choose a favorite Titan. The soundtrack rivals that of Forrest Gump, and there is so much goodness that of course I cry. There's the element of fall in which school starts back up and the football stands are full of sweatshirts and turtlenecks and breath you can see through the shouting. "Listen to their souls, men. I killed my brother with malice in my heart. 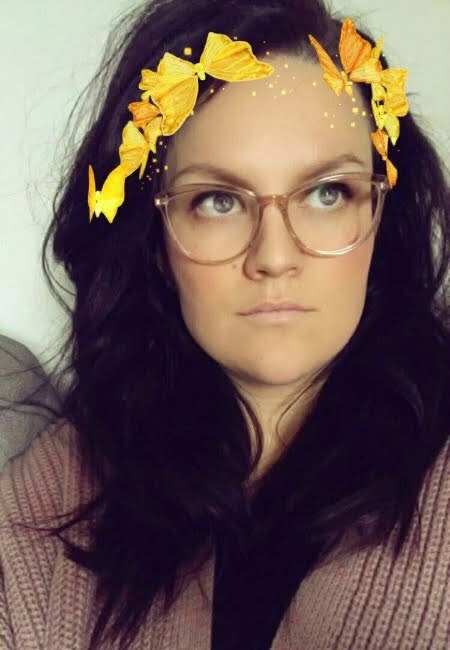 Hatred destroyed my family. You listen, and you take a lesson from the dead. If we don't come together right now on this hallowed ground, we too will be destroyed, just like they were. I don't care if you like each other or not, but you will respect each other. And maybe... I don't know, just maybe we'll learn to play this game like men." This movies seems to be a given. 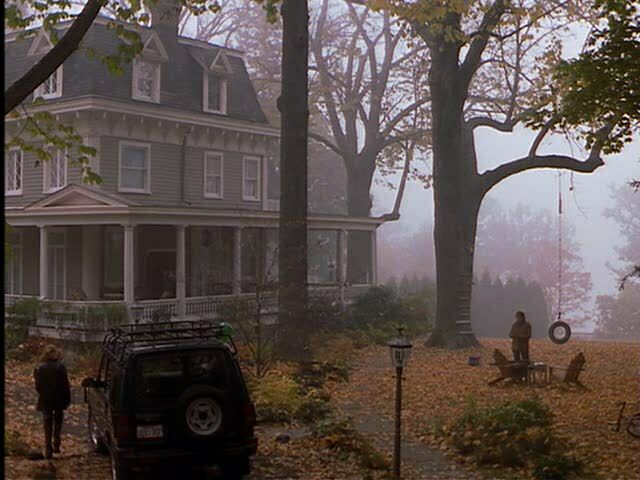 The photo above is just iconic and synonymous with fall in my mind. My senior year of high school, I saw this movie for the first time. Since I have a deliciously obsessive personality, I think I watched it every day for at least a week. When friends came over, it was my only movie suggestion. I think it is where my Meg Ryan girl crush really began. I love movies that span friendships over many years. I love it when best friends finally realize they're the ones they're supposed to be with. I love how Billy Crystal sang Surrey with the Fringe on Top when his former wife and Ira walked up. And, THE SOUNDTRACK. It's baby Harry Connick, Jr! When he was a twinkle in our eyes. When he hadn't yet grown into his lips, and Michael Buble was probably still in a crib. Waiter, there is too much pepper in my paprikash. But I would be proud to partake of your pecan pie. "How about this way? I love that you get cold when it's 71 degrees out. I love that it takes you an hour and a half to order a sandwich. I love that you get a little crinkle above your nose when you're looking at me like I'm nuts. I love that after I spend the day with you, I can still smell your perfume on my clothes. And I love that you are the last person I want to talk to before I go to sleep at night. And it's not because I'm lonely, and it's not because it's New Year's Eve. I came here tonight because when you realize you want to spend the rest of your life with somebody, you want the rest of your life to start as soon as possible." I think it was a few months ago that ABC Family was playing this every night for ten weeks and I watched it every time because apparently I'm a glutton for punishment. It makes me ugly cry all over the place. I feel like I remain a tiny bit composed until Jackie (Sarandon) walks in to her room and it's filled with the cardboard cutouts of her little ones. Then, it's non-stop tears and swollen eyes and snot for the rest of the movie because I just can't handle it. I feel like anyone that comes from a divorced family feels the agony of it a bit deeper, but even so I still want to punch Jena Malone in the face about ten times because she gets away with so much sassiness. Isabel: Look down the road to her wedding. I'm in a room alone with her, fixing her veil, fluffing her dress, telling her no woman has ever looked so beautiful. And my fear is she'll think, "I wish my mom were here." Jackie: And my fear is... she won't. Tom Hanks and Meg Ryan, just kill me dead. Sleepless in Seattle doesn't really do it for me. I remember watching this for the first time when I was very young and didn't appreciate it. It's New York! It's AMERICA ONLINE! It's full of cardigans and romance and The Cranberries. It's perfection. The supporting cast cannot be beat (Parker Posey, Greg Kinnear, Miss Rhode Island from Miss Congeniality, and Steve Zahn). It's sweet and innocent. It's The Shop Around the Corner, people. How can you resist its charm? How can you not feel deep pangs of guilt every time you step into a Barnes & Noble or Joseph Beth now? "I would have asked for your phone number and I wouldn't have been able to wait 24 hours before calling and asking, "How about coffee, drinks, dinner, a movie, for as long as we both shall live?" 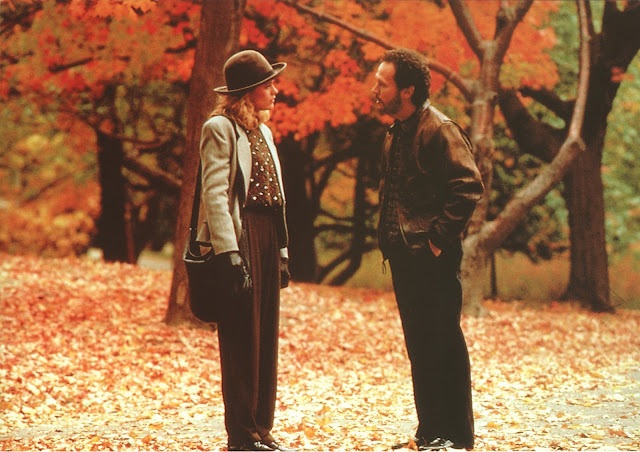 What are your favorite Fall movies? Tell me! This is a comment to proclaim my ardent love for You've Got Mail. Sometimes I wish the internet was still like it was in that movie and you could go into a chat room and meet your soulmate instead of a bunch of creepy perverts. Or did that ever really happen for anyone other than Meg and Tom? It's SO true. I would love that movie even if only because it made me believe someone like Meg Ryan and someone like Tom Hanks would just HAPPEN to fall in love from a chat room...AND that they already knew each other. It's what makes me love romantic comedies. Because they make me believe the completely unbelievable. LOVE ACTUALLY! I meant to add that to the list. That is a FAVE. For sure. And, hahahaha I knew someone would say something. I just didn't expect it from someone who ran the whole thing! YOU ALREADY KNOW EVERYTHING! I am pretty sure that you are right and it's time for us to be reunited. Runaway Bride, we just discussed! The Martina McBride montage, the hill, leaves, dress, hair. I'm watching it again tonight. Beware the one eyed snake! I am still kicking myself for omitting Runaway Bride. Camille and I were just talking about it the other day. Oh my gosh I am going to go watch it right now. Thanks, Candace! We just watched it on our honeymoon. It was the only movie I brought. It made me so excited to go home and be there for the arrival of Fall :) You are not loons - I am continually surprised that more people haven't seen it. I don't even remember it being in theaters! Apparently you love crying in the fall as well! Dan in Real Life? CRY. Stepmom? UGLY SOB. Remember the Titans? CAN'T. EVEN. Love these movies. They are so cozy! I want to watch Stepmom right now but then I don't think I would recover for the rest of the day. This is the perfect post! All of these are on my fall list. My number one top fall movie is Practical Magic. Then Stepmom is number two. Following that are the LOTR movies and then all of the movies on your list also! ER MER GERRRD PRACTICAL MAGIC! I actually was going to include that one, but couldn't find a great harvest picture. 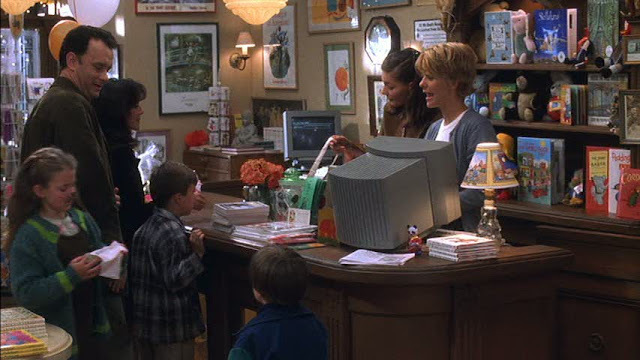 But when I was looking for pictures I was remembering how great the margarita scene is - AND, HOW MUCH do you wish you worked in Sandra Bullock's shop? It's perfection. That shop and that town is basically my life goal. Love it. Where even was that? Somewhere in New England, because all good movies are. Was it Maine? I love A Goofy Movie Too! "I gotta...STAND OUT!!!" And I also LOVE Dan in Real Life. And I can't find our copy of it anywhere!!! Only the case, which is just a tease :( I should probably just break down and buy a new one. And I've never seen You've Got Mail! What the heck?!?! I need to get on that! That soundtrack CANNOT be beat. Somebody put one of our Modern Family discs in the Dan in Real Life box and I PANICKED when I opened it. I thought it was gone forever. False alarm! You need a new one for sure. ANNE YOU NEED TO COME OVER AND WATCH YOU'VE GOT MAIL WITH ME. Dan in Real Life! I adore that movie SO much. And Sondre? Can't even handle it. I've loved him for years and still listen to that sountrack all the time. You've Got Mail is another favorite. In fact, I need to go watch it asap. I can't even choose any other perfect fall movies. You nailed it. I feel like I read somewhere recently that he had a new album coming out soon - maybe it was a live album? Maybe I am making that up? Regardless, he is great and now I want to go listen to him. I am KICKING myself because I forgot Runaway Bride. That seems like such a grave error. I am married! Hooray! Thank you! Remember the Titans is one of my favorite movies ever! Makes me cry every time. And You Got Mail makes me feel so bubbly inside. Perfect for a rainy, fall day. Congratulations on being married!! I'm SO happy for you. Remember the Titans is one of those movies that even though I know what happens - I always hope Gary won't be in the car accident. And I am so upset every time when it happens anyway despite my hoping.